Meet Jackie Scura Scholarship Recipient Hannah Feldman! 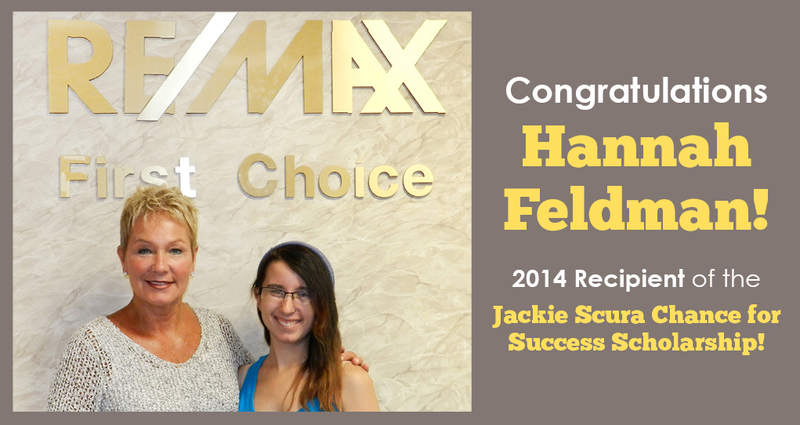 Congratulations 2014 Jackie Scura Chance for Success Scholarship Recipient Hannah Feldman! 2014 marks the 11th year that Parsippany Realtor Jackie Scura has awarded her “Jackie Scura Chance for Success” scholarship to a local High School Senior. This Scholarship isn’t about recognizing academic achievement or athletic prowess. Instead, each year Jackie looks for the candidate who she feels exemplifies the sort of work ethic which has brought her success in her own life and career. This year’s recipient is an exceptional Parsippany High graduate named Hannah Feldman. Hannah’s independence and confidence in herself came through clearly in her application. She has worked steadily since the age of 16 while, at the same time, challenging herself to excel at school. This determination took her from struggling academically to the High Honor Roll in her Senior Year. Despite her busy schedule, Hannah also contributed to her community as President of her Temple Youth Group, leader of the BRITE Club at Parsippany High School and a volunteer at her Hebrew school. Never one to lose momentum, Hannah got a jump start on her college career with courses at Richard Stockton College in Galloway, NJ this Summer. She plans to continue her studies there with a double major in Psychology and Social Work. Her ultimate career goal is to become a counselor in order to help others.